Former Iowa offensive tackle Brandon Scherff is heading to the nation’s capital after being selected as the fifth pick in the first round of the NFL draft Thursday by the Washington Redskins. Scherff was a little surprised at being picked so early, but was prepared. “I’m just happy, I talked to may agent and he said anything could happen and I just had my phone on the table, I saw it ringing and I said ‘oh boy here we go.’ They just said I want you to be a Redskin, and I said I would love that,” Scherff says. Now its on to the next stage of his football career. Scherff says he talked to the Redskins coach Bill Callahan and Callahan told him he loves the way he plays. “A dream come true, every since I was a little kid I always wanted to do this. 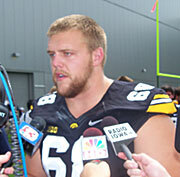 First it was playing college football, and then I set a new goal for myself,”Scherff says. He says seeing the phone ring was a big weight off his shoulders and he can figure out what to do next. Scherff decided to stay at Iowa for his senior season and ended up being a two-time all-American and won the Outland Trophy this last season.